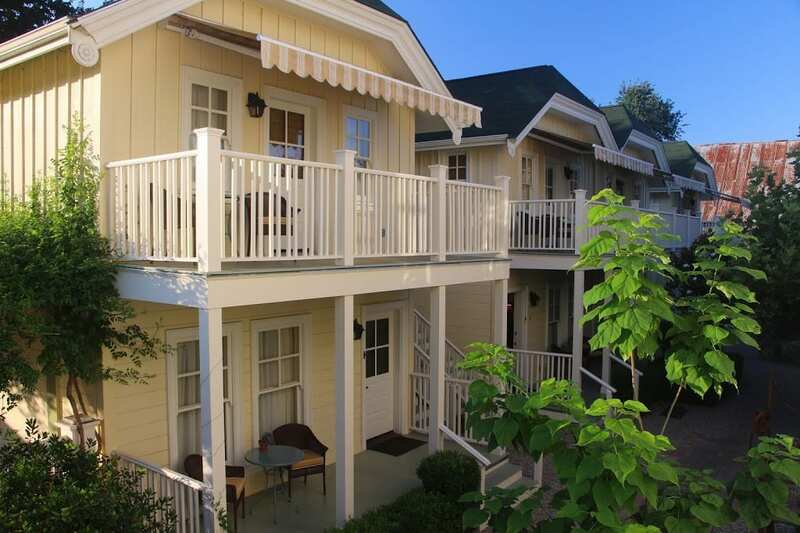 Walking the wide, wrap-around porch of the elegantly-restored Tallman Hotel in Upper Lake is like stepping back in time. Hushed strains of early jazz filters through the lobby. 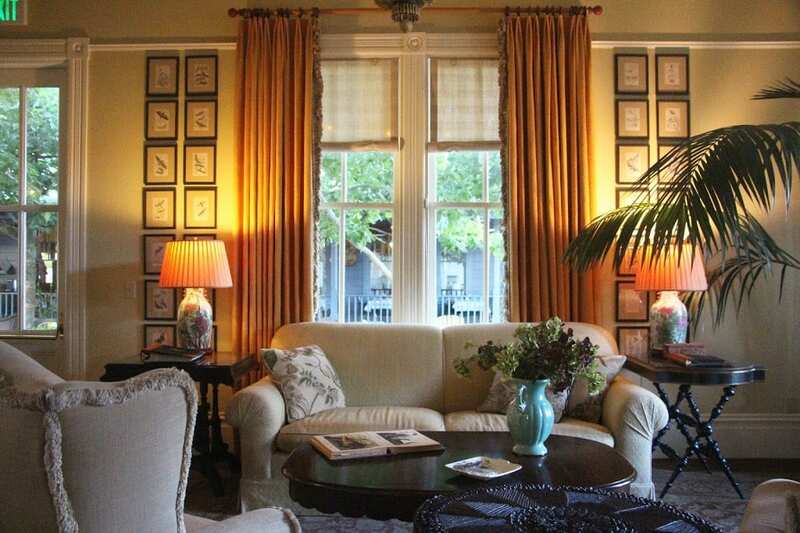 A French wood bead chandelier hangs from the high ceilings. Dozens of framed field-guide etchings and subtle hand-painted murals evoke the surrounding countryside’s flora and fauna. The refinished fir floors and period-perfect architectural details provide the backdrop for a sophisticated blend of antiques, fabrics, and eclectic treasures, including a Tramp Art table trimmed in pine cone scales. 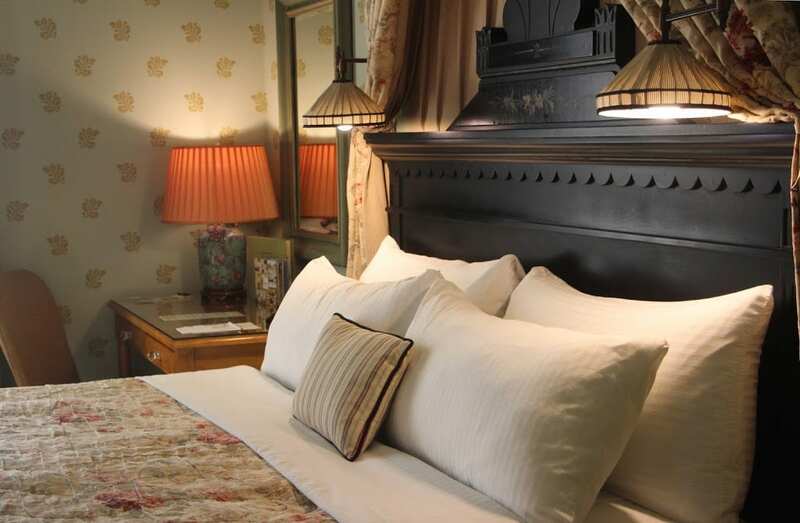 The same exacting period details and refined décor are carried through the guest rooms upstairs. The room I stayed in features 12-foot ceilings, a king-size bed with Eastlake style furnishings, an art-deco chair, hand-painted lamp shades, and a gold scroll chandelier. An unlikely mélange of custom-designed wallpaper and fabrics in a varying patterns (floral, plaid, stripes) and colors (pale blue, chartreuse, ochre, faded reds) merge together seamlessly to evoke a bygone era while appealing to modern sensibilities. The armoire hides a small refrigerator, coffee maker, and a wide screen television with DVD player. The in-suite bath features mosaic hex tile floors, a claw foot tub that is large enough to lie down in, pedestal sinks, and a subway-tiled walk-in shower with vintage fixtures and spray nozzles so intricate they come with a set of instructions. A glass-panel door opens to the second-floor veranda with antique wicker seating and ceiling fans spinning lazily overhead. The veranda overlooks a shady courtyard strung with lights and amusing pieces of art hidden among the trees. The 17-room hotel includes four veranda rooms on the second floor of the main building, four suites in outlying buildings, and nine garden rooms in cottages built along the back of the property. 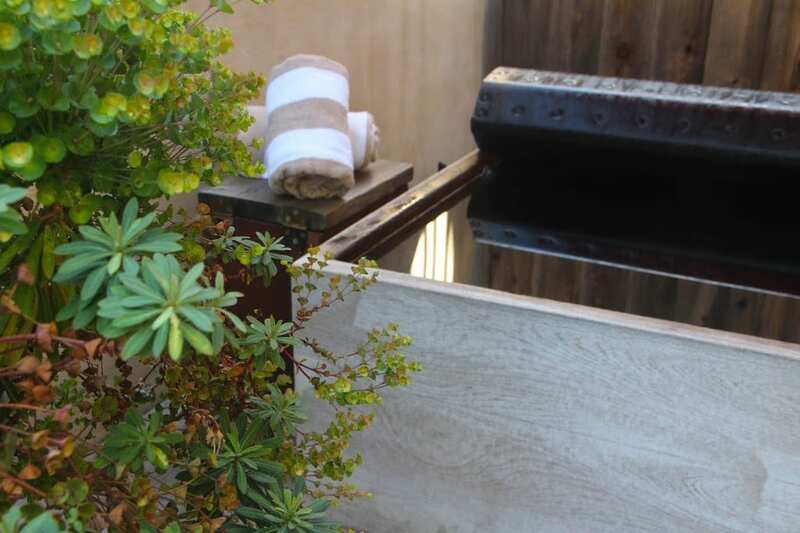 The four lower garden rooms feature private patios with deep, Japanese Ofuro soaking tubs and outdoor showers. 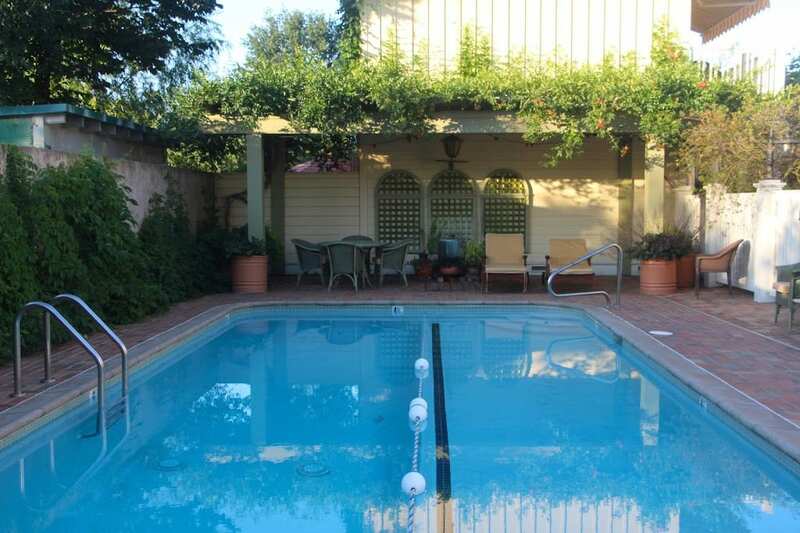 A tranquil swimming pool and arbor-covered patio is tucked beside the cottages. The property exudes the grace and luxury of a turn-of-the-century hotel run by a family with impeccable taste. 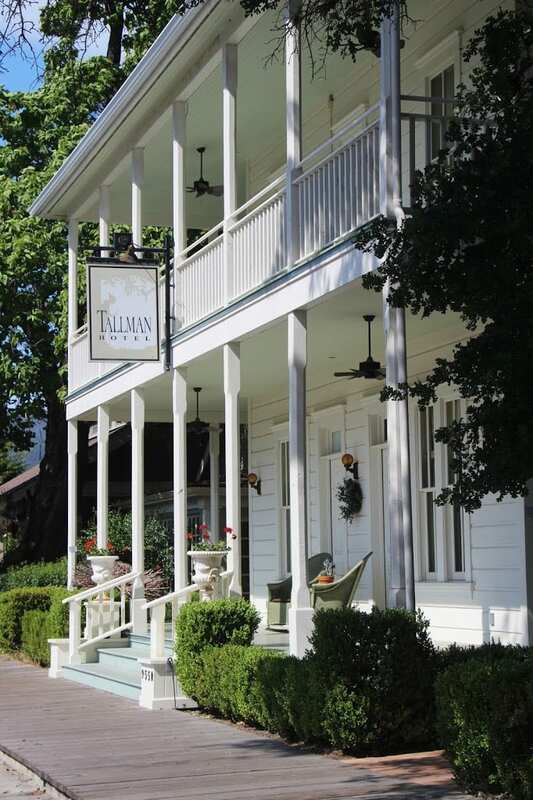 The Tallman Hotel was originally built in the 1870s by one of Lake County’s first non-native settlers, Rufus Tallman. The Western-style hotel, along with its adjacent livery stable and saloon, was popular among many well-heeled travelers who journeyed by stagecoach from Sacramento and San Francisco to soak in Lake County’s natural mineral spring waters. When his original hotel burned to the ground in 1895, Rufus–with characteristic pioneer pluck–rebuilt the hotel. Following his death in 1904 and later, his wife Mary in 1912, their daughter Winnie Riffe and her husband Hank inherited the stately hotel. They changed the name to Riffe’s Hotel and continued running the hotel for many decades. Two additional owners succeeded the Riffes, but eventually, the hotel fell into disrepair. It had stood vacant for 40 years before current owners Bernie and Lynne Butcher purchased the property in 2003. With a vision of restoring the hotel to its original grandeur and re-creating other buildings lost to the ravages of time, the Butchers teamed with the San Francisco design firm of Candra Scott & Anderson. They moved the hotel with its original redwood framing back from the street and salvaged many architectural details, including the fir floors, staircases, and banisters. 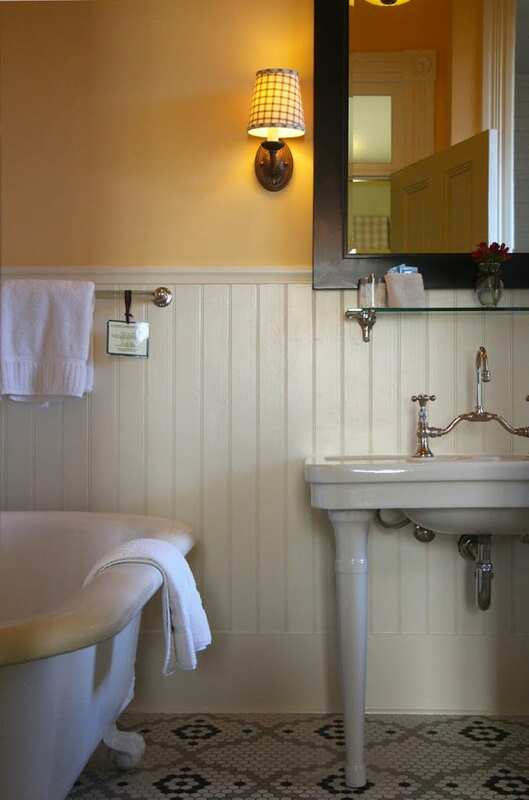 They introduced period moldings, tile floors, and claw foot tubs in keeping with the age and style of the hotel. They built new structures drawing upon architectural styles of different eras to give the impression that the hotel’s buildings and grounds evolved over time. 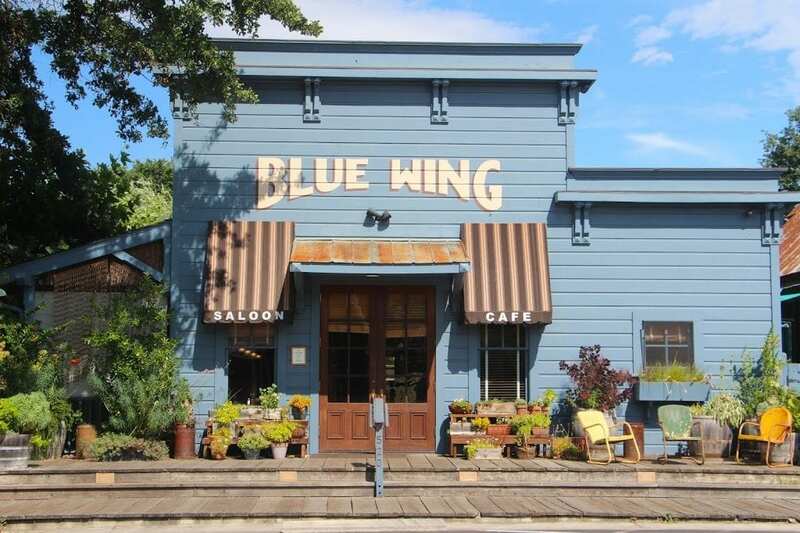 Across the courtyard from the hotel, they re-imagined and reconstructed the Blue Wing Saloon, a popular watering hole from the 1880s that was torn down during prohibition. The rebuilt restaurant and bar has a nostalgic Old West vibe, featuring an antique, wooden back bar salvaged from a 19th-Century pub in Pennsylvania. The wooden dining tables and expansive bar were built on-site by local craftsmen from a 100-year-old walnut tree harvested from the property. Old-growth redwood wainscoting found hidden beneath layers of paint and wallpaper during the hotel’s renovation was repurposed for use in the saloon. The saloon re-opened in 2005, followed by the hotel in June of 2006. The restoration of the hotel and the saloon has led to something of a revival of Upper Lake. A new archway welcomes visitors to the entrance of town. The historic downtown is lined with new sidewalks and graceful new street lamps. New shops have also opened their doors. Lake County Wine Studio opened in 2007 and showcases wines from over 40 wineries in the burgeoning Lake County wine region. After checking into the hotel, I walked through downtown and then popped into the wine shop, where they offer complimentary tastings for guests of the hotel. Bordered by Napa and Sonoma to the south and Mendocino to the west, Lake County is a lesser-known wine region, but it wasn’t always that way. Winemaking in Lake County stretches back to the Gold Rush era and flourished with large-scale wineries and thousands of acres of vineyards through the early 20th Century. Prohibition, however, brought Lake County wine production to a halt. Winemakers turned to growing walnuts and pears, which remain the region’s top agricultural products. But winemaking in Lake County is now enjoying a resurgence thanks to a new generation of winemakers who are drawn by the region’s unique terroir. The volcanic soils and higher elevations produce grapes with thicker skins and more intensely concentrated fruit. The hot summer days followed by cool nighttime temperatures add to the quality and variety of grapes that thrive in Lake County. The region’s rural beauty and chance encounters with wildlife add to the experience for wine enthusiasts seeking less-traveled wine tasting routes. As the wine shop owner Susan Fieler was pouring tastings for me, two long-time Lake County residents, Gary Lewis and Mary O’Meara, walked through the doors and pulled up stools next to mine. The couple are regulars of the wine shop and they bantered freely with Susan. The couple owns a local walnut farm and nursery, Suchan Farms, which has been in Mary’s family for 60 years. Suchan Farms is well-known locally for their quality walnuts, including a rich red walnut variety which is often used for holiday baking. While chatting at the bar, Mary told me her father stayed at the Tallman Hotel in 1943 when it was known as Riffe’s Hotel. She found his signature written with a quill and ink in one of the hotel’s old guest registries and discovered he had paid just $3.50 a night. 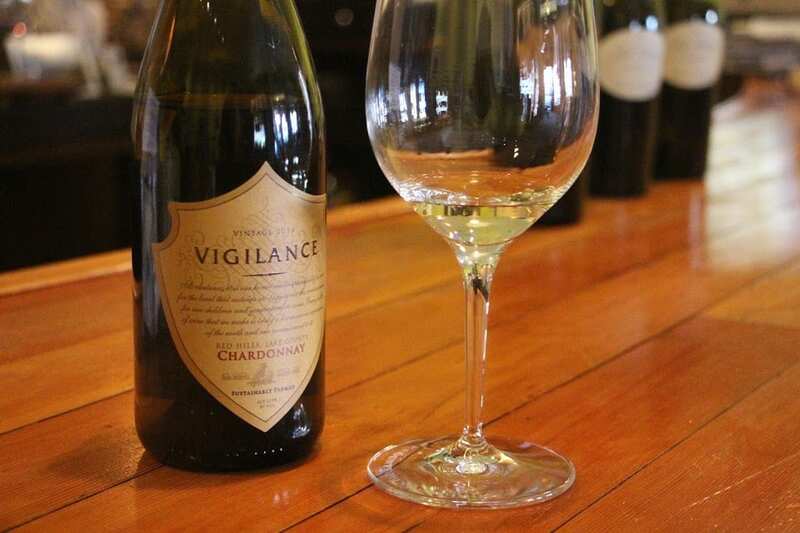 The last of the wine tastings that evening was a local 2013 Vigilance Cabernet Sauvignon; it was a fantastic wine. I bought a bottle and then walked back across the street to the Blue Wing Saloon for dinner. 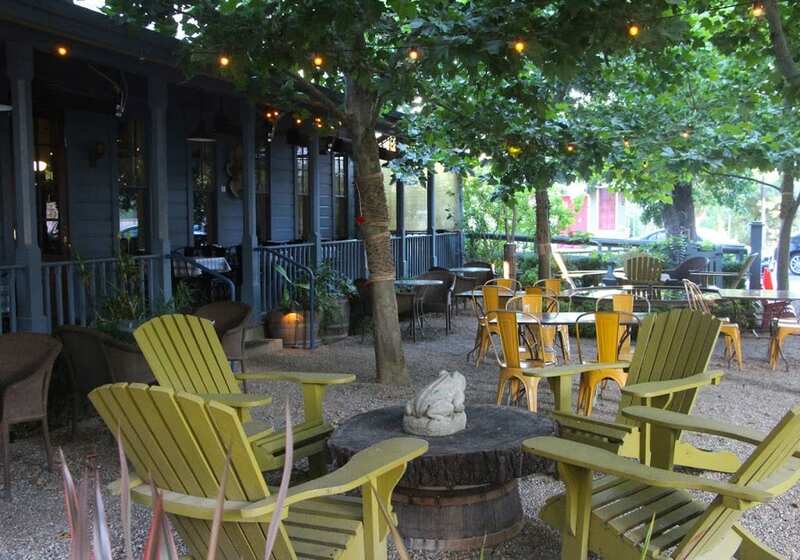 It was a warm evening and the restaurant was crowded inside, so I sat in the garden courtyard beneath the shade of the sycamore trees, which were strung with lights. 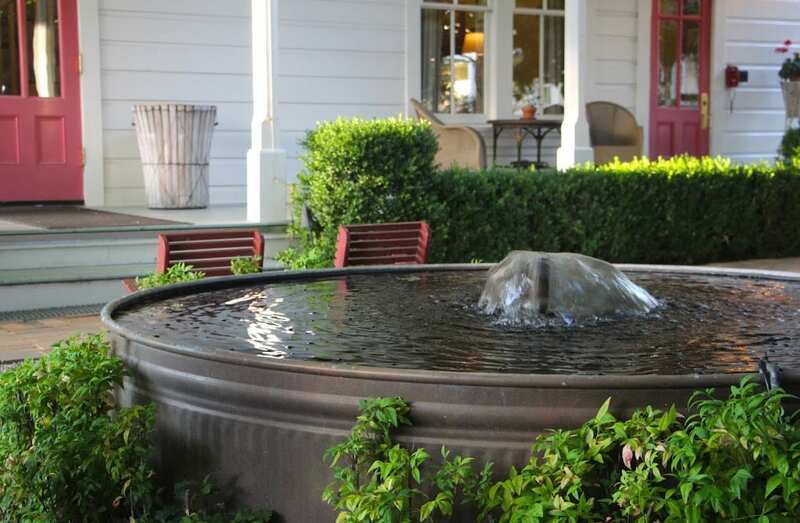 It’s an enchanting space with Adirondack chairs, metal sculptures, other objets d’art, and a gurgling fountain made from a galvanized metal tub. The menu features upscale pub fare that changes with the seasons and incorporates locally-sourced ingredients whenever possible. The saloon also offers a wide selection of local Lake County wines and artisanal beers. Sunday through Tuesday, the saloon hosts live music starting with a range of acts playing for Sunday brunch, jazz on Sunday evenings, blues on Mondays, and a special $20 three-course dinner with live music on Tuesdays. I feasted on filet mignon with a black pepper sauce served with a blue cheese bread pudding and broccolini garnished with red bell pepper, olives, and feta. It was delicious. I was trying to avoid dessert, but the waitress talked me into their butterscotch pudding with a caramel sauce and whipped cream. “If you can’t finish it,” said the waitress, “You can always take it back to your room, stick it in the fridge, and have it for breakfast.” I did exactly that. Back in my room, I sat on the veranda, listening to the trickling fountain in the courtyard below. A chorus of crickets joined in as the evening grew darker. It would have been an idyllic spot to get lost in a book, but I had been traveling for business and needed to catch up on a pile of emails and work. 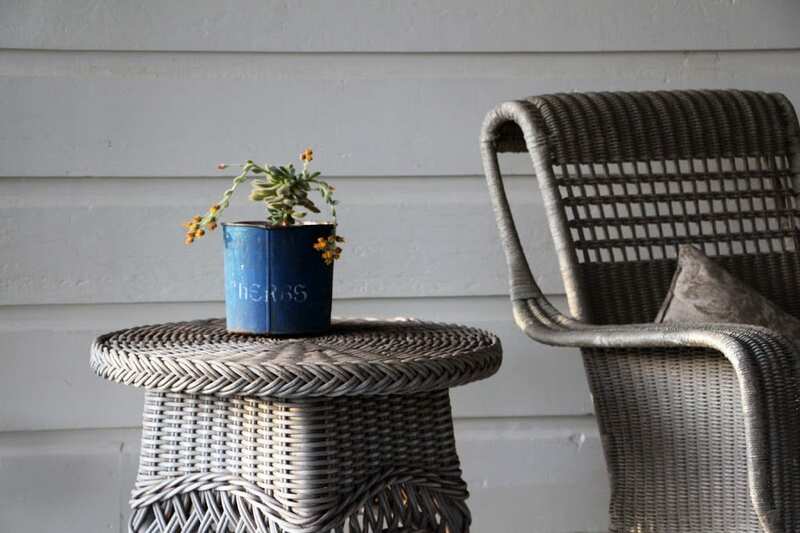 Free WiFi and a handy electrical outlet next to the wicker chair just outside my room allowed me to plug in to recharge my laptop, download my emails, and get to work… all while enjoying the crickets and the crisp night air. The hotel may look much as it did in the 1890s, but it spares no modern convenience or amenities. In fact, its historic façade also belies the hotel’s state-of-the-art geothermal and solar energy systems. Hidden below ground, a GeoExchange system heats and cools the property and generates hot water for the guest rooms and Ofuro soaking tubs. Hidden from sight on the south-facing roof of the restaurant, solar panels generate electricity to complement and augment the GeoExchange system during peak usage times. And while the livery stable may have served visitors to the Tallman Hotel over a century ago, the hotel now offers electric vehicle charging stations for a new generation of guests. 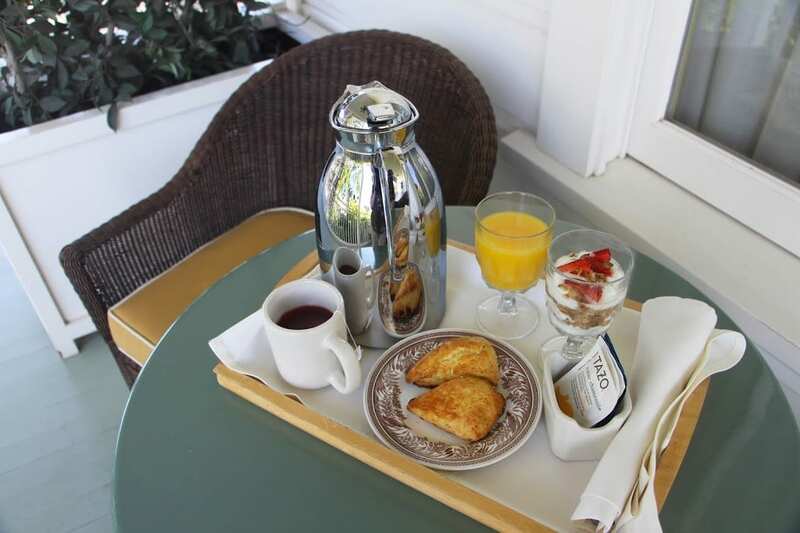 A continental breakfast is typically served buffet style in the dining room downstairs, and guests can choose dine in the dining room or to take a tray to their room or any of the outdoor seating areas. At slower times–like the night I stayed–the innkeepers can deliver breakfast to the room. In the morning, the innkeeper knocked at my door with wooden tray set with linen napkins and fine china carrying hot tea, juice, a granola parfait, and the hotel’s signature item: warm, freshly-baked scones topped with a sprinkling of raw sugar. I carried the tray out to the veranda to enjoy breakfast outdoors in the shade. The highlight was most definitely the scones… plus the butterscotch pudding I had saved from the night before.